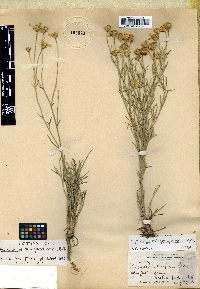 Perennials, 30-100 cm (poly­carpic; sometimes with sparingly branched, woody caudices). Stems 1(-3), green throughout or purple-red-tinted proximally, branched distally, ± hairy. Leaves: blades simple or lobed (lobes 3-17), glabrous or sparsely hairy, gland-dotted; mid leaves lobed (lobes 5-11, terminal lobes 0.8-2 mm wide). Heads 5-50+ per plant, in paniculiform to corymbiform arrays. Peduncles 2.5-7 cm, ± hairy. 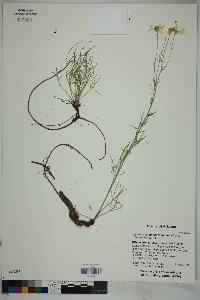 Involucres campanulate, 8-10 × 9-12 mm. Phyllaries in 2 series, unequal; outer 5(-8), basally connate 1/3-1/2 their lengths, obovate to ovate, 6-7 mm, apices acuminate; inner 6-8, obovate, 6.5-8 mm, apices mucronate. Ray florets 5-8; corollas yellow, 14-18 × 7-12 mm. Disc florets 30-100+; corollas 3.5-4.3 mm. Cypselae obpyramidal, 2.5-3.9 mm; pappi of 5-6 obovate, sometimes aristate, scales 1.2-2.5 mm. 2n = 30. Flowering (Jun-)Jul-Sep(-Oct). Open areas, edges of pine-oak forests; 1500-2500 m; Ariz. Hymenoxys quinquesquamata is known from southern Arizona, mostly Huachuca Mountains.